This is a great article from National Georgraphic. In recent years, Peru’s eclectic cuisine has earned acknowledgement as one of the world’s finest. But while quinoa and pisco sour cocktails have migrated to become favorites around the world, the best Peruvian specialties are still found in their home country. Here are ten to try en route to Machu Picchu. There’s no way to sugarcoat it. 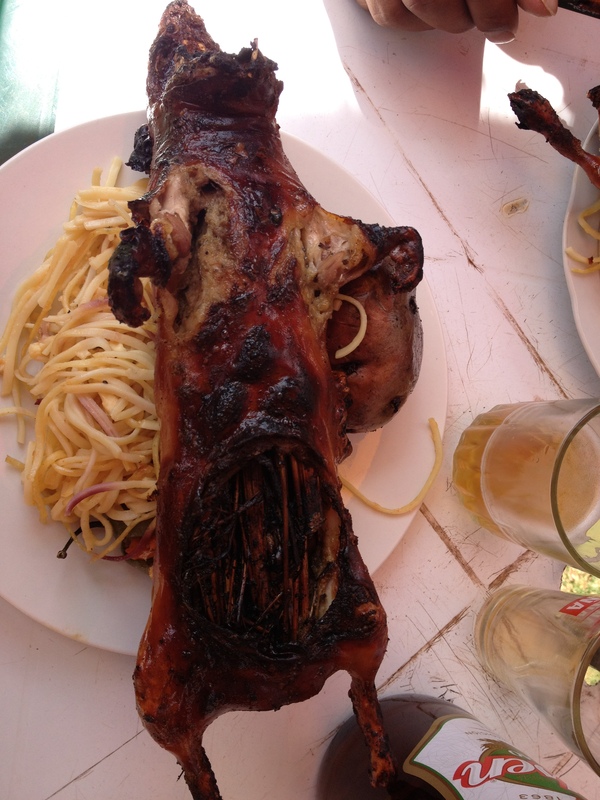 This staple meat raised in many households of the Andes goes by a different name in the United States: guinea pig. (One indication of how important the dish is to the rural Peruvian diet: In a cathedral in Cusco hangs a replica of Da Vinci’s Last Supper, in which Christ and the 12 disciples are seated around a platter of cuy.) The meat, which is quite bony, is usually baked or barbecued on a spit and served whole—often with the head on. It has a pleasant, gamy taste like that of rabbit or wild fowl. A visitor to any market in Peru is certain to find two things—hundreds of varieties of potatoes, which may have originated here (Peru’s longtime rival Chile also claims tuber originality), and piles of avocados large enough to toboggan down. A traditional causa layers these two ingredients into a sort of casserole, which is sliced and served cold. Other layers might contain tuna, meat, or hard-boiled egg. A hundred years before anyone had heard of Asian fusion cuisine, boatloads of Chinese immigrants arrived in Peru looking for work. 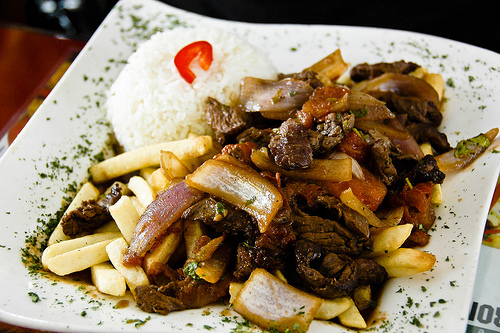 The ingredients and techniques they added to Peru’s food vocabulary are probably best exemplified by this hearty hybrid stir-fry, in which beef, tomatoes, peppers, and onions are blended in a pan with soy sauce and fried potatoes. Not a dish for the carb-phobic; it’s usually served over white rice. The yellow aji pepper lends its color—a hue similar to Tweety Bird’s—as well as its mild kick to several Peruvian dishes. Among them is this rich, velvety stew made with chicken and condensed milk and thickened with de-crusted white bread. A vegetarian alternative with a similar flavor is the ubiquitous papa a la huancaina, boiled potato with creamy yellow sauce. These skewers of grilled, marinated meat (much like shish kebabs) are served everywhere in Peru. High-end restaurants offer them as entradas, or appetizers. Street-cart vendors sell them slathered in a garlicky sauce. While almost any meat can be prepared this way, the most traditional—and best—anticuchos are made with beef heart, a practice believed to trace back to the days when Peru’s Spanish conquerors would consume a cow’s choicest cuts and leave the organs for their slaves. The icy Humboldt Current that flows through the Pacific Ocean just off Peru’s coast supports one of the world’s most bountiful sources of seafood. If Peru had an official national dish, it would probably be this preparation of raw fish marinated in citrus juice. The acid in the fruit “cooks” the fish, giving it a delicate flavor and slightly chewy consistency. 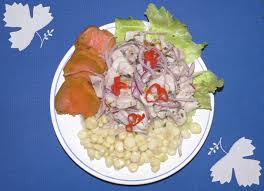 The dish is usually spiced with red onion and aji pepper, and served (typically at lunch) with sweet potato or choclo, a white Andean corn with dime-size kernels. Bold gastronomes can drink the leftover citrus marinade, which is known as leche de tigre, tiger’s milk. This dish is typically associated with Arequipa, Peru’s second largest city, but it is served everywhere. What appears to be a plain-old red bell pepper is actually a fiery Capsicum pubescens (at least ten times as hot as a jalapeño when raw, but boiled to reduce its thermonuclear properties), stuffed with spiced, sautéed ground beef and hard-boiled egg. This is topped with melted white cheese, baked, and served whole. While Peru’s cuisine is most famous for its spicy and savory dishes, Peruvians adore sweets, too—as evidenced by the popularity of Inca Kola, a teeth-melting bubblegum-flavored soda. Lucuma is a tree fruit that looks like a mango, but it has a custardy taste akin to maple syrup. It’s usually used as a flavoring in desserts, and is justifiably popular as a variety of ice cream. This Peruvian-style roast chicken is so delicious—and popular—that it’s now available in cities around the globe. 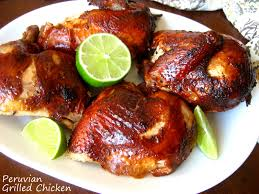 The secret is marinating the bird in soy sauce flavored with red peppers, garlic, and cumin, which gives the meat and skin a smoky, salty taste. Outside Peru it’s typically paired with French fries, but the more traditional accompaniment is fried yuca, a waxy tuber that has a pleasant chewiness and holds its own against the spicy dipping sauces with which pollo a la brasa is typically served. To read the article as published by National Geographic, click here.